Since some of Berlins boroughs are even named after hills (Prenzlauer Berg, Kreuzberg, Schöneberg etc), there must be at least some proper options for downhill winter sports. And – yes – there are some – even if people coming from more mountainous areas won’t be much impressed with those options. I know the proper translation for the german term “Rodelbahn” would probably be “toboggan run” – but that just sounds a little bit too professional to me. To me Toboggan Run sounds like serious winter sports. In Berlin however we basically just have a few hills that you can take your sledge for a ride on. Please feel free to correct me if I’m wrong – but I’ll stick to ‘sledding hill‘ for now. Berliners basically do know where they take their sledge for a ride in the winter time – when the weather is right. 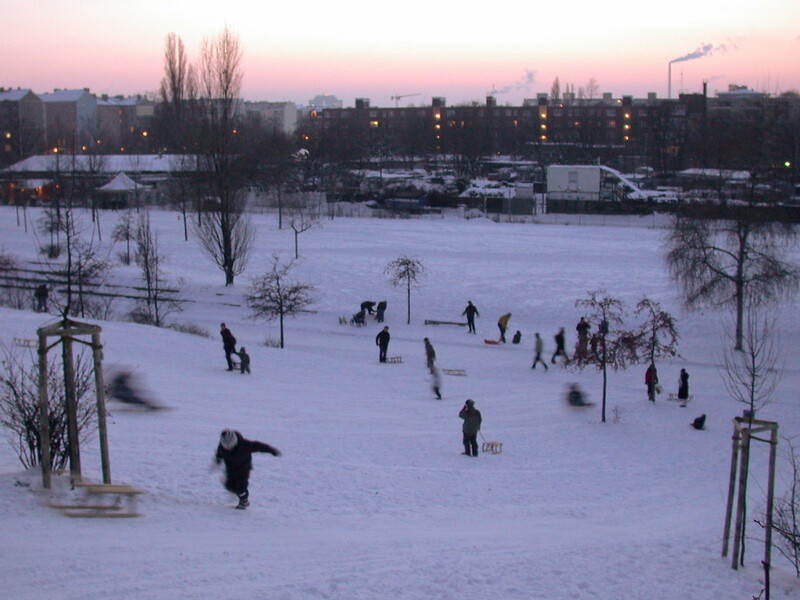 Most Berliners probably won’t bother to travel to one of the ‘proper’ sledding hills – if after all there is any. Instead they would stick either to the next best hill in the neighborhood. Others would actually travel across the city to stick to one that they are used to. But if you spent your childhood days on the country side in the North of Germany, you might be used to even less spectacular hills than the Berlin hills – and might cherish the few true sledding options Berlin has to offer. The different sledding backgrounds of ‘The Berliners’ and the different demands emerging from these backgrounds can be found on the various sledding locations: while some people just have to travel all the way to Zehlendorf’s legendary sledding location “Onkel-Toms-Hütte”, to the infamous former U.S.-Army spying base ‘Devils Hill’ (‘Teufelsberg), to Britz or to Volkspark Friedrichshain, others are quite content with the options they find ‘around the corner down the street’. Of course this does not mean that the local ‘small’ hills would be less attractive than the more established ones – at Mauerpark (Prenzlauer Berg), Weinbergspark (Mitte), Humbodhain (Wedding) and Viktoriapark (Kreuzberg) the ride may not take as long, as it does on the long ‘pro’ slopes, but since you can go ‘down’ way more often, chances aren’t bad you become a professional on the short track, knowing every stick, every stone, every bump and every jump by heart. And if you have any additional suggestions: please feel free to leave them in the comments below this posting..:] Thank you!! And enjoy your winter in Berlin!